If you have any questions post them here and Lois will answer. Have a great run, enjoy the weather, let Lois know if you’re in for post-run pizza, the KofC bar will be open! 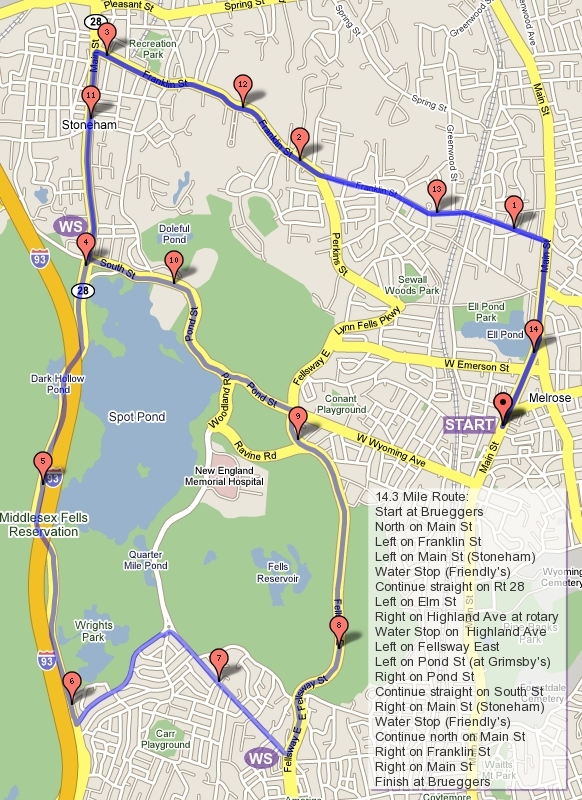 It’s time to plan the Boston Course Run which will be on March 24th this year. For those new to it, or those that have forgotten, three weeks prior to Boston we leave Brueggers at 7AM, carpool out to Hopkinton, people get out and run, others move cars from water stop to water stop along the whole course, and in the end we all wind up at Boston College around lunch time. After that we head back to Melrose and maybe we have lunch. To make this all happen without a hitch everyone must follow my elaborate plans. (1) Cars? I have a handful of drivers already volunteering, and each of them has a car. As runners sign up we’ll need a seat in a car for each of them. Most cars fit four comfortably, so if you have a car with many seats and don’t mind someone else driving it, we could borrow it. If you are running the full or close to it, you can’t drive the course (you’ll be running and your car won’t magically appear at the finish). If you volunteer your car be prepared for it to be in use between 7AM and 2PM. (2) Drivers? Again, note that its very difficult to run and drive at the same time. I know you all can drive from Melrose to Hopkinton, I’m more interested in who can drive the car along the race course from Hopkinton to BC. 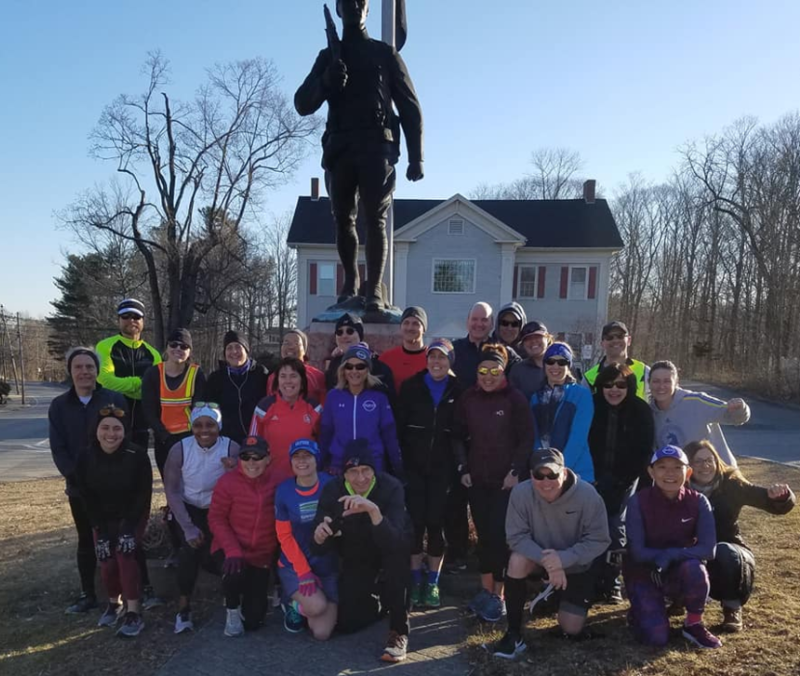 People who want to run only half of the course can switch in Wellesley and drive the other half… if they have someone that can drive the other half. If you’re driving be prepared to be needed between 7AM and 2PM. (3) Runners? I assume somewhere between 1 and 50 people which makes it hard to plan. Let me know you’re running by THIS WEDNESDAY, last minute additions are not easy and frankly make me very angry. If you don’t let me know by Wednesday I probably won’t have a seat for you. Also let me know how far you plan on running (full or half, of somewhere in between). If you’re running the half indicate a preference of first half (flat to downhill) or second half (flat to hilly). I’ll try to fit you in to your preferred part of the run. Again, if you’re running just a bit of the run still be prepared to be with us from 7AM to 2PM. Right now things just fit, please no last minute additions! Tomorrow I’ll put together the detailed plan together, but please confirm your inputs. Week 11 – May The Road Rise To Meet You ???? Last Week – I hear was miserable! While most were off running races, a few trudged through some of the Sunday Long Run in wind blown snowy conditions. Congrats to Black Catters, Malden Lap Runners, and the SLR troopers. This Week – Start your St Patrick’s Day off with some miles. I assume the hilly side of Breakheart is unrunnable, but the flatter side is. If it isn’t Tom and Audrey are in charge of setting you off in a different direction. But I think the plan will be to run Swain’s Pond, head to Breakheart, run the flat side but skip the hills and pop out at the Voc and run back Farm Street. Start 1 – Everyone crosses Main Street and turns immediately left on to East Foster. Run up to Melrose Common and take a right onto 6th Street. Continue straight as this becomes Swains Pond Avenue. Swains Pond will take you up to Turners Pond where you’ll turn right at a stop sign to continue on Swains Pond Ave. There will be a point where you meet Lebanon Street, sometimes people just follow left and end up in Malden, don’t do that, instead take a sharp right onto Lebanon, then a left at the traffic lights on to Forest Street. At the end of Forest Street you’ll hit Main Street where you’ll find Water Stop 1 in the parking lot of Citizens Bank. Start 2 – Everyone continues together onto Winter Street, past the Oak Grove MBTA stop to a 5-way intersection. Cross straight across to get on Glenwood Street. This will take you through some hilly roads over to Highland Ave where you’ll turn right and then immediately turn right onto the Fellsway East. Continue on to Grimsby’s where you’ll go straight on to the LynnFells Parkway. When you get to Melrose High School look for a water stop at the knoll on your right. Half Finish – If you’re running the half route you’ll continue on with the full runners down the LynnFells Parkway until you get to the stop light at Main Street in Saugus. Turn left, and immediate left onto Howard. Take Howard back to a left on Green Street. Green Street will merge with Main Street which will take you back to Brueggers with 11 miles under your belt. 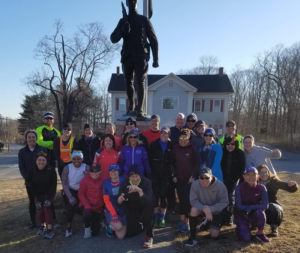 Full 3 – If you’re running the full you’ll continue along the LynnFells Parkway until you hit the Saugus Breakheart entrance. Head up to the headquarters and look for a water stop. Full 4 – Run the flatter side of Breakheart by entering to the left, keeping right at the beach and popping out at the Vocational School. Run down to Wakefield High School and turn left on Farm Street. Farm will become Main Street in Saugus where you’ll take a right at the second set of traffic lights back on to the LynnFells Parkway. Continue back to Melrose High School where the last water stop will be waiting for you. Full Finish – To finish the full you’ll take the LynnFells back to Grimsby’s, turn left on Wyoming and left on Main and finish at Brueggers with 18 miles to your credit. Water Stops – After a night of celebrating St Patrick’s Day we should have some combination of Tom, Audrey, and Hank out there to get you through. Roll Call – Who will we see at the top o’ the mornin’? Next Week – Time to start planning next week. I won’t be around, but I will be planning the Hopkinton to Boston College Run. I would like you to not just IFTF and IFTH for this week, but if you can not whether you are planning on running all, half, or none of next week’s run let me know now. I also would like those driving to let me know. Starting after tomorrow’s run there will be a daily post about what will happen next week. Thanks!